HP OfficeJet Pro 6960 all-in-one is a mid-range inkjet printer that might found big for casual home purpose but is well suited for small office work purpose. The printer includes automatic double-sided (duplex) printing, scanning, copying, and faxing functions along with wired and wireless network connection. The only obvious omission is a USB host port for printing or scanning functions. The print resolution of this printer is approx 1200 x 600 dpi and the speed of the printer is 29ppm for black and white and 20ppm for the colour one. To get professional level print results at less price, the printer uses high-quality compatible HP OfficeJet Pro 6960 ink cartridges. These cartridges are comparatively less in cost and aim at delivering the best quality print results. With this HP printer, one can expect to print straight from the smartphone or tablet, no matter how far one is from his printer. OfficeJet Pro 6960 also supports Apple AirPrint or Google Cloud Print to get better printing experience. The HP OfficeJet Pro 6960 all-in-one printer is a great option for small offices. It is comparatively cheap to run then its similar printer models which makes it a good choice for everyday office work. By considering the specification of the printer, it offers a great value for money on printing with the automatic document feeder (ADF) as a standard. What should be done if HP OfficeJet Pro 6960 All-in-One Printer consumes a large amount of electricity? Step 1: A good amount of power is conserved while the printer is in sleep mode. After the first initial setup, the printer will go into the sleep mode just after five minutes of inactivity. You must follow the instructions given below to change the period of inactivity before the printer enters into the sleep mode. Go to the control panel section of the printer. Press the tab at the top of the screen to open the dashboard, then press the power management tab. Step 2: The Auto-off mechanism provides the facility to turn the printer off after 8 hours of inactivity. Auto-off turns off the printer completely, so when you want to use the printer use the power button to turn on the printer again. Note: If you turn off the printer improperly, it will cause a problem with the HP OfficeJet Pro 6960 ink cartridges and you may face print quality issues. Step 3: Do scheduling to automatically turn on or off the printer on particular days. Use the following procedure to schedule the day and time for on and off. Open the control panel and choose the dashboard tab there. Press schedule printer on and off. Press the desired option and follow the onscreen instructions to set the day and time to turn off and on the printer. Note: Never turn off the printer if HP OfficeJet Pro 6960 ink cartridges are missing. We recommend you to replace missing cartridges as soon as possible to avoid damage to the ink system. Q. How am I supposed to pay for the HP OfficeJet Pro 6960 ink cartridges? What is your refund policy? A. You can pay for our products using the following cards: Laser Card, American Express, MasterCard or Visa credit card, Maestro, Switch, Solo or Delta debit card. The transactions done on this website are hosted by Sage Payments to ensure security. You can also choose to pay using PayPal, for any of our products. In case you are entitled to a refund, the amount will be refunded to you on your card or through PayPal, depending on how you purchased the product. Q. What are the features of this printer? A. The HP OfficeJet Pro 6960 All-in-One is a multifunction printer that is capable of scanning, copying as well as faxing documents. It has a monthly duty cycle of 20,000 pages a month, and a moderately fast printing speed. The printer supports multiple operating systems and can also connect to devices wirelessly, including mobile devices. This printer is perfect for small businesses. Q. Due to a tight budget, I wish to use your compatible HP OfficeJet Pro 6960 ink cartridges for my printer. However, I am worried that the compatible ink cartridges may damage my printer and end up costing me more than buying original ink cartridges. A. You do not need to worry about any harm caused to your printer when using our compatible ink cartridges. All our ink cartridges are of high quality, that have been factory tested under ISO standards so that they work well with your printer. We assure you that our compatible ink cartridges will work smoothly with your printer, without causing any problems. Q. 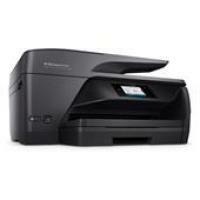 Are HP OfficeJet Pro 6960 All-in-One printers capable of borderless printing? A. Yes, HP OfficeJet Pro 6960 All-in-One printers come with borderless printing feature. However, not all media types support this feature. You will be alerted by your printer, if the media type you have selected does not support the feature. Q. Which model of compatible HP OfficeJet Pro 6960 ink cartridges do you provide? A. We provide our customers with the HP 903XL ink cartridges, which are high yield ink cartridges that can print more pages than the standard ink cartridges. We also provide the HP 907XL black ink cartridge that can print up to 1500 pages.